The Avro 504 was a World War I biplane aircraft made by the Avro aircraft company and under licence by others. Production during the War totalled 8,970 and continued for almost 20 years, making it the most-produced aircraft of any kind that served in World War I, in any military capacity, during that conflict. Over 10,000 would be built from 1913 to the time production ended in 1932. First flown on 18 September 1913, powered by an 80 hp (60 kW) Gnome Monosoupape engine, the Avro 504 was a development of the earlier Avro 500, designed for training and private flying. It was a two-bay biplane of all-wooden construction, with a square-section fuselage. Small numbers of early aircraft were purchased both by the Royal Flying Corps (RFC) and the Royal Naval Air Service (RNAS) prior to the start of World War I, and were taken to France when the war started. One of the RFC aircraft was the first British aircraft to be shot down by the Germans, on 22 August 1914. The pilot was 2nd Lt. Vincent Waterfall and his navigator Lt Charles George Gordon Bayly (both of 5 Sqn RFC) The RNAS used four 504s to form a special flight in order to bomb the Zeppelin works at Friedrichshafen on the shores of Lake Constance. Three set out from Belfort in north-eastern France on 21 November 1914, carrying four 20 lb (9 kg) bombs each. While one aircraft was shot down, the raid was successful, with several direct hits on the airship sheds and destroying the hydrogen plant. Soon obsolete as a front-line aircraft, it came into its own as a trainer, with thousands being built in the war, with major production types being the 504J and the mass production 504K, which was designed with modified engine bearers to accommodate a range of engines, in order to cope with engine shortages. 8,340 Avro 504s had been produced by the end of 1918. In the winter of 1917-18, it was decided to use converted 504Js and 504Ks to equip Home Defence squadrons of the RFC, replacing ageing B.E.2cs, which had poor altitude performance. These aircraft were modified as single-seaters, armed with a Lewis gun above the wing on a Foster mounting, and powered by 100 hp (75 kW) Gnome or 110 hp (80 kW) Le Rhx�ne engines. 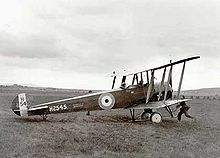 274 converted Avro 504Js and Ks were issued to eight home defence squadrons in 1918, with 226 still being used as fighters at the end of World War I. Following the end of the war, while the type continued in service as the standard trainer of the RAF, large numbers of surplus aircraft were available for sale, both for civil and military use. More than 300 504Ks were placed on the civil register in Britain. Being used for training, pleasure flying and banner towing, civil 504s continued flying in large numbers until well into the 1930s. Although Avro 504s sold to China were training versions, they participated in battles among warlords by acting as bombers with pilot dropping hand grenades and modified mortar shells. The improved, redesigned and radial engined 504N was produced by Avro in 1925. After evaluation of two prototypes powered by Bristol Lucifer and Armstrong-Siddeley Lynx engines respectively, the Lynx powered aircraft was selected by the RAF to replace the 504K. 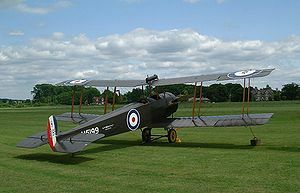 592 were built between 1925 and 1932, equipping the RAF's five flying training schools, while also being used as communication aircraft. The 504N was also exported to the militaries of Belgium, Brazil, Chile, Denmark, Greece, Thailand and South Africa, with licenced production taking place in Denmark, Belgium, Canada and Japan. The 504N was finally replaced in 1933 by the Avro Tutor in RAF service, with small numbers continuing in civilian use until 1940, when seven were impressed into RAF service, where they were used for target- and glider-towing. 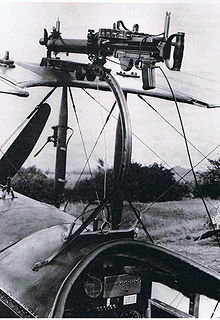 The 504 was the first aeroplane to strafe troops on the ground as well as the first to make a bombing raid over Germany. It was also the first Allied aeroplane to be downed by enemy anti-aircraft fire and was Billy Bishop's first army aircraft. 504: 80 hp (60 kW) Gnome engine. Modified with smaller ailerons and broader struts. 80 hp (60 kW) Gnome engine. Version for RNAS with larger fin. 80 hp (60 kw) Gnome or Le Rhx�ne engine. Single-seat anti-zeppelin aircraft for the RNAS. The 504C was fitted with an extra fuel tank, in place of the observer. Single-seat anti-zeppelin aircraft for the Royal Flying Corps. Six built. 504E: 100 hp (75 kW) Gnome engine. Ten built. 504F: 75 hp (60 kW) Rolls-Royce Hawk engine. One built. 504G: 80 hp (60 kW) Gnome engine. Used for catapult trials. 80 hp (60 kW) Gnome engine. Used as a trainer. 100 hp (75 kW) Gnome or 80 hp (60 kW) Le Rhx�ne engine. Two-seat training aircraft. The 504K had a universal mount to take different engines. Single-seat fighter conversion used for anti-zeppelin work. Several were assembled in Australia by Australian Aircraft & Engineering. 130 hp (100 kW) Clerget, 100 hp (75 kW) Gnome or 110 hp (80 kW) Le Rhx�ne engines. Hybrid trainer based on 504K fuselage with 504N undercarriage and wings and powered by rotary engine. Built under license in Mexico as Avro Anahuac. Floatplane version. 150 hp (112 kW) Bentley BR1, 130 hp (100 kW) Clerget or 110 hp (82 kW) Le Rhx�ne engines. Three-seat cabin biplane. Only one was ever built. 100 hp (75 kW) Gnome engine. Two-seat training aircraft. Redesigned postwar trainer for RAF with 160 hp (120 kW) Armstrong Siddeley Lynx engine. 598 built. Floatplane version of 504N. First aircraft to fly above the Arctic Circle in 1923 Oxford Expedition. Unbuilt version of the 504N with side-by-side seating. Three-seat cabin biplane. The 504Q was built for the Oxford University Arctic Expedition. Only one was ever built. Armstrong Siddeley Lynx engine. Reworked trainer with revised, lightweight structure. Five prototypes flown 1926 to 1927 with various engines (100 hp/75 kW Gnome Monosoupape, 100 hp/75 kW) Avro Alpha, 140 hp/104 kW Armstrong Siddeley Genet Major and 150 hp/110 kW) Armstrong Siddeley Mongoose), with the Mongoose chosen for production aircraft. Ten were sold to Argentina, with 100 more built by FMA under licence in Argentina. At least six were exported to Estonia, remaining in service until 1940, and an unknown number to Peru. Two-seat training aircraft. Built under licence in Japan by Nakajima. Japanese version of the Avro 504N, powered by a 130 hp (100 kW) Mitsubishi-built Armstrong-Siddeley Mongoose radial piston engine, 104 built. Improved version of the K2Y1, powered by a 160 hp (120 kW) Gasuden Jimpu 2 radial piston engine. 360 built (K2Y1 and K2Y2). Russian copy of the 504K. Over 700 built. A small number of static display, and airworthy examples of the Avro 504 exist, almost a century after the first one flew, one of the airworthy examples being the Shuttleworth Collection's example -another flyable example exists in a Canadian aviation museum. An Avro 504K can also be found on static display in the Making of the Modern World Gallery at the London Science Museum. The Old Rhinebeck Aerodrome has had a flyable Avro 504 reproduction aircraft, powered by an original 110 hp Le Rhx�ne rotary engine, flying since 1971, and a newly founded company (Blue Swallow Aircraft) in Virginia is starting to produce reproduction Avro 504 examples. Belgian Air Force purchased 50 British-built 504Ks from 1920-22, with a further 27 being built under license by SABCA These were replaced by the 504N, 17 being built by Avro in 1929-31, and 31 being built under license. The following companies are recorded as manufacturing the Avro 504 under licence. A. V. Roe and Co Ltd, Park Works, Newton Heath, Manchester; and at Hamble Aerodrome, near Southampton, Hants. Hewlett and Blondeau Ltd, Oak Road, Leagrave, Luton, Bedfordshire. The Humber Motor Co Ltd, Coventry Morgan and Co, Leighton Buzzard, Beds. TNCA, Balbuena field in Mexico City. Bruce, J.M. (9 July 1954). "The Avro 504: Historic Military Aircraft No. 8, Part I" (pdf). Flight: pp.41-44. http://www.flightglobal.com/pdfarchive/view/1954/1954%20-%201998.html. Bruce, J.M. (16 July 1954). "The Avro 504: Historic Military Aircraft No. 8, Part II" (pdf). Flight: pp.83-88. http://www.flightglobal.com/pdfarchive/view/1954/1954%20-%202060.html. Mikesh, Robert C.; Abe, Shorzoe (1990). Japanese Aircraft 1910-1914. London: Putnam. ISBN 0 85177 840 2. Avro 504 Pictures and Avro 504 for Sale.